The compact digital eight-track of choice if you don't need onboard drums. Ease of use; CD-quality audio recording; useful range of insert FX; CD burner. Display hard to see; live audio from stereo mix input cannot be recorded to master track. There are plenty of useful connections around the back. But the genre is still going strong - particularly at Tascam, the pioneers of the whole personal studio revolution with the original Portastudio. It has just brought out a new digital Portastudio model: the DP-02. The DP-02 records uncompressed 16-bit, 44.1kHz CD-audio to an internal hard drive and also has a CD-RW writer. The effects processor in the DP-02 means that you can add an effect to the dry input signal and record the whole sound. The effects are categorised by instrument - electric guitar, acoustic guitar, bass, vocal, drum - and by far the largest group are those for electric guitar with almost 80 presets, all having just one adjustable parameter. All have descriptive names and a brief description in the manual, and there are sounds with amp and speaker emulation plus effects for plenty of different musical styles. Besides the effects, another benefit for the guitarist on the DP-02 model is that it has an onboard tuner. Other guitarist-friendly features on both machines are the hands-free recording modes that mean you can keep your hands on the instrument and initiate recording with an optional footswitch or by programming in timing points for the automatic punch in/punch out function. For more sophisticated beats an external drum machine or sequencer can be synchronised as the machine can transmit MIDI Clock or MTC. The life of the eight tracks can, however, be extended to make bigger productions by track bouncing either to spare tracks or, if all tracks are full, by bouncing all eight to the stereo master track and then moving that bounced audio to a pair of playback tracks and clearing the remaining tracks to record more audio. As for mixing, you get high and low EQ knobs on each playback channel plus panning and one effects send. With both machines this effects send can be used to access an external effects processor with its output being brought back into the left and right return sockets. The DP-02 also has reverb in its onboard effects processor, which can be used instead of external effects. 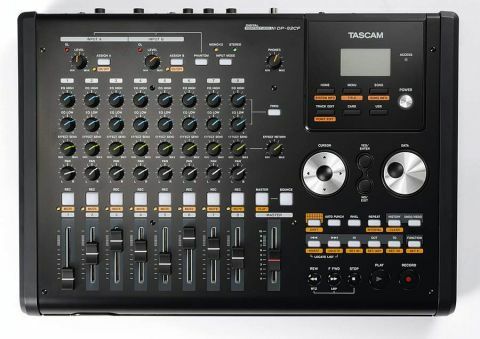 Tascam has always intended its Portastudio range to be as simple to use as possible and the DP-02 is no exception. Sound-wise, the preamps in the two input channels seem well up to scratch so the recorded audio quality is really good. The effects processing in the DP-02 can add another dimension to the sound as it's being recorded and there is plenty of variety available in the type of effects available. While the amp sims are not as close to the real thing, or as adjustable as you'd get in a separate dedicated unit, they are very usable - plugging in and playing seems natural. In terms of sounds offered there's stuff that will appeal to a wide range of players from mellow jazz to metal. In our view, reverb is an essential element in any mix and the reverb in the DP-02 adds that vital sense of space that can 'glue' the tracks together.